Dante Alighieri was a Florentine poet. He’s famous for the Comedy, an epic poem written, for the first time in Italian history, in vernacular (Latin was the official written language). Because of this, Dante is considered the father of Italian language. 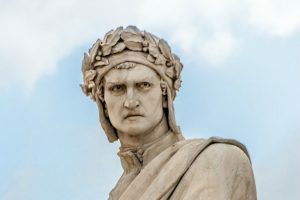 Dante Alighieri biography is a good example of how a capable man was in condition to succeed in the medieval Florence, unlike in the feudal Europe, even though not born from a rich family. Dante Alighieri biography is closely linked to the events of Florentine political life. At his birth (1265), Florence was about to become the most powerful city in central Italy. Starting from 1250, a municipal government composed of bourgeois and artisans had put an end to the supremacy of the nobility, and two years later the city started to mint the golden Florin which would become the main currency in Europe. The conflict between Guelphs, faithful to the temporal authority of the popes, and Ghibellines, defenders of the political supremacy of the emperors, became more and more a war between nobles and middle class. At the birth of Dante, after the expulsion of Guelph, the city was for over five years in the hands of the Ghibellines. In 1266, Florence returned to the hands of the Guelphs, and Ghibellines were expelled in turn. Dante Alighieri was born in Florence May 29, 1265 (the date is presumed, however, between May and June) from a family of minor nobility. In 1274, according to Vita Nuova, he met Beatrice (Bice di Folco Portinari) for the first time and immediately fell in love with her. Dante was about ten years old when his mother Gabriella died. In 1283 his father Alighiero of Bellincione, merchant, died as well and Dante, at the age of 17, became the head of the family. The young Alighieri followed the teachings of philosophy and theology of the Franciscan (Santa Croce) and Dominican (Santa Maria Novella) schools. In this period, he became a friend and began a correspondence with the young poets who called themselves “stilnovisti” (new style poets). At the age of twenty he married Gemma Donati Di Manetto, belonging to a sub-branch of a great noble family, with whom he had four children. In 1292, two years after the death of Beatrice, he began writing the “Vita Nuova”. Especially after 1293, following a decree that excluded the nobles from Florentine political life, the young Dante is forced to stick to the care of his intellectual interests. In 1295 an ordinance decreed that the noble got back their civil rights, provided that they belonged to a guild. Dante subscribed to the guild of doctors and pharmacists with the mention of “poet”. When the fight between White and Black Guelphs got tougher, Dante took sides with the party of the Whites trying to defend the independence of the city opposing the hegemonic tendencies of Boniface VIII, Pope from December 1294 to 1303. In 1300 Dante is elected among the six “Priori” – keepers of the executive power, the government’s most senior judges who composed the Signoria – that, to mitigate the bias of the political struggle, take the difficult decision to arrest the fiercest leaders of the two factions. In 1301, the party of the Blacks took over (supported by the papacy), Dante was called to Rome to the court of Boniface VIII, where a political process started: Dante, accused of corruption, was suspended from public office and sentenced to pay a heavy fine. Dante did not appear before the courts, and was sentenced to confiscation of property and to death “if he was found in Florence”. Thus he was forced to leave the city with the consciousness that he was mocked by Boniface VIII, who had kept him in Rome while the Blacks took power in Florence; Boniface VIII will be placed into “Inferno” in the “Divine Comedy”. In 1306 Dante undertook the drafting of the “Divine Comedy” which will be his work of a lifetime. In 1308 he composed a Latin treatise on language and style: the “De vulgari eloquentia”, which passes in review the different dialects of Italian evidencing the imperfections of these languages. He founded the theory of a vernacular he calls “illustrious”, which can not be one of the local dialects of Italian language but a result of the work of cleaning carried out collectively by Italian writers. It is the first attempt for the creation of a national literary Italian language. In 1310 with the arrival in Italy of Henry VII of Luxembourg, Holy Roman Emperor, Dante Alighieri hopes in the restoration of the imperial power, which would allow him to return to Florence, but Henry suddenly died near Siena. Dante composed “The Monarchy”, in Latin, where he states that the universal monarchy is essential to earthly happiness of men and that the imperial power must not be subservient to the Church. Around 1315, he was offered to return to Florence. His pride considered the conditions too humiliating (he was asked to publicly apologize). In 1319 Dante is invited to Ravenna by Guido Novello da Polenta, Lord of the city; two years later he sent him to Venice as ambassador. Returning from Venice Dante was hit by malaria and died at 56 in the night between 13 and 14 September 1321 in Ravenna, where he is buried.